My first voyage into the world of the FA Cup of Actors and highly enjoyable it was too. 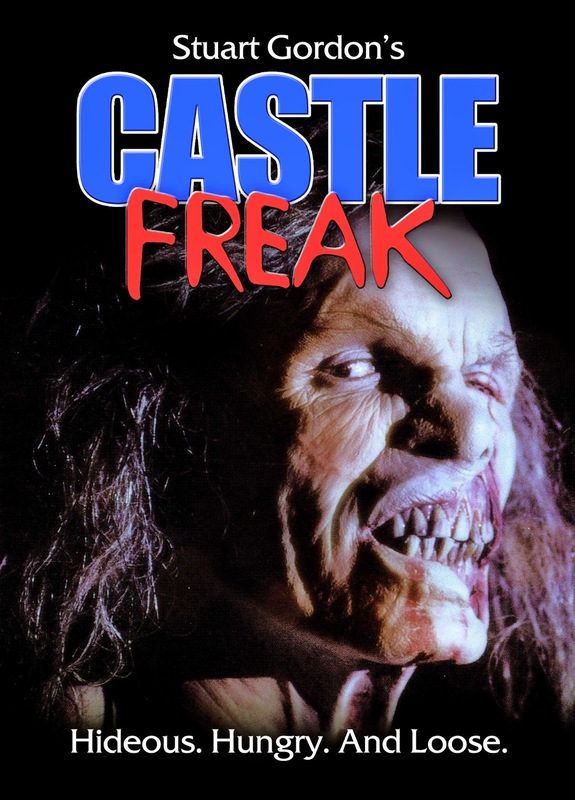 I was fearing the worst as Castle Freak doesn’t exactly look like my cup of tea, but I was pleasantly surprised by the atmosphere, story and the fact that it doesn’t take itself too seriously. It’s a fairly standard horror offering, but what it lacks in originality it makes up for with straightforwardness and, it has to be said, sleaziness. Having said that, I thought I was focusing on Jeffrey Combs for the FA Cup, and he is absolutely terrible in this. He’s wooden, joyless and displays such a lack of subtlety that I find it difficult to believe he is actually an actor. 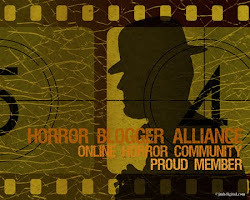 (I don't actually think he is - but he's still a quality horror icon - evlkeith.) Luckily enough however, I was supposed to be focusing on Barbara Crampton who strolls through the film with an air of class and confidence that led me to believe if she ever got her hands on the Castle Freak she’d kick hell out of him. She’s way better than this standard of film on this performance. I was going to knock a point off the score because of Combs, but Crampton cancels out his amateurishness. To cut a short story even shorter…married couple John and Susan with their blind daughter, rock up at a spooky Italian castle that they’ve inherited. Surprise, surprise, a castle freak lives in the castle and all kinds of high jinks ensue when he gets loose. The freak himself is a somewhat pathetic villain in the truest sense of the word, but his makeup is believable and he atones for his slightly melancholic demeanour with a sneakiness and violent nature that he combines brilliantly with a creepy and sleazy side of his personality. At times he’s almost scary, but he certainly lives up to his name. All in all it’s an entertaining package of spooky atmosphere, decent acting (apart from Combs) and amusing horror antics from the freak. It’s approaching an average viewing experience but not quite, so I’ll award Castle Freak 4.5/10, which sends Barbara into the next round of the FA Cup. It’s a well deserved victory and on this showing I’d look forward to seeing her in some meatier roles. 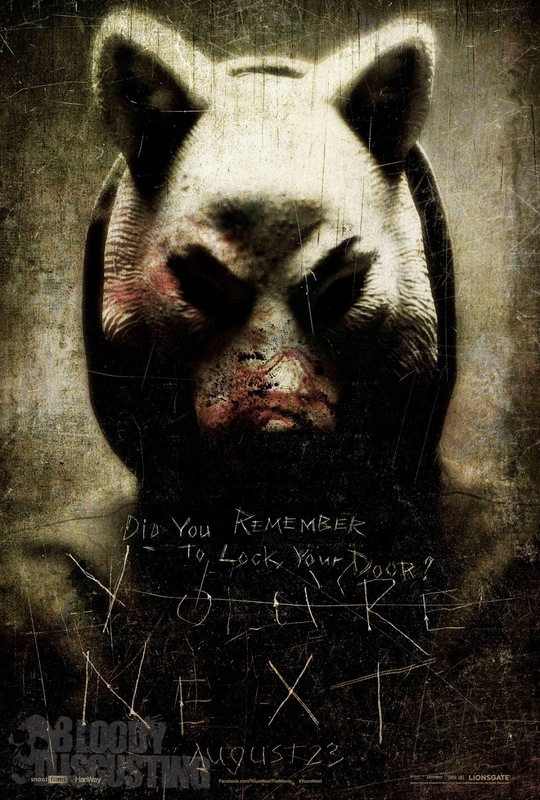 I've seen both You're Next and The Innkeepers recently and seeing as though there seems to be some kind of friendly connection between the directors, (they both directed segments of the dire V/H/S and Ti West actually appears in You're Next) I decided to pit them against each other. Both films suffer from some failings of current (and past) horror films: a reliance on loud noises for scares, characters who split up and go into dark rooms armed only with a torch, and worst of all not being horrific or scary in the slightest. Now let's get to the differences. You're Next bucks the trend of having a heroine who starts off weak and then increases in strength throughout the film. Erin (Sharni Vinson from Home and Away) is a different character altogether. She goes to a dinner party with her partner Crispian at his family's home. They have a bit of snap accompanied by some not too pleasant chat - Crispian gets accused of baby-snatching by his brother - and then the film turns into a house under siege type affair as the family gets attacked by blokes in white animal masks. Two other problems I have with You're Next are the colour palette and the severe lack of gore. This has to be one of the most beige films going. Hearing the director talking to the colour grader must have been a thrill-a-minute, "No, that's way too much colour. I can actually see a blue pixel there. Make it more beige. Ah, that's better. Nice and bland." Then the gore: it feels more like a slasher from the eighties where severe censorship was rife. It looks like it's been cut badly and that somewhere out there is a director's cut that has all of the juicy violence reinstated. I doubt this is the case though. The Innkeepers suffers massively from the stupid characters syndrome also but it gets away with it due to a fantastically likeable performance from Sara Paxton (a distant relation to Bill Paxton). Her reactions to scary occurrences are priceless and had me chuckling away at the sheer quirkiness of it all. It distracted me from the low quality of the actual scares. Claire (Sara Paxton) works at a soon to be abandoned hotel with her friend Luke (Pat Healy) and they are trying to investigate stories of a ghost that supposedly roams the hotel for Luke's new website. Funnily enough, spooky things start to happen. If I had to sum up You're Next in one word it would be 'smug'. There is a pervasive sense of smugness to the whole production. Whereas, the word I would use for The Innkeepers would be 'charming'. Shame about the ending which badly cripples the overall rating but I would still watch it again. Anyway, let's see the final score for these two horror offerings. A Horrible Way to Die, The House of the Devil. When I decided to put Joan Fontaine into the FA Cup of Actors I was expecting to randomly generate a quality black and white offering along the lines of Rebecca or Letter From an Unknown Woman. But no, what turns up but a slice of action from the disputed master of disaster, Irwin Allen. 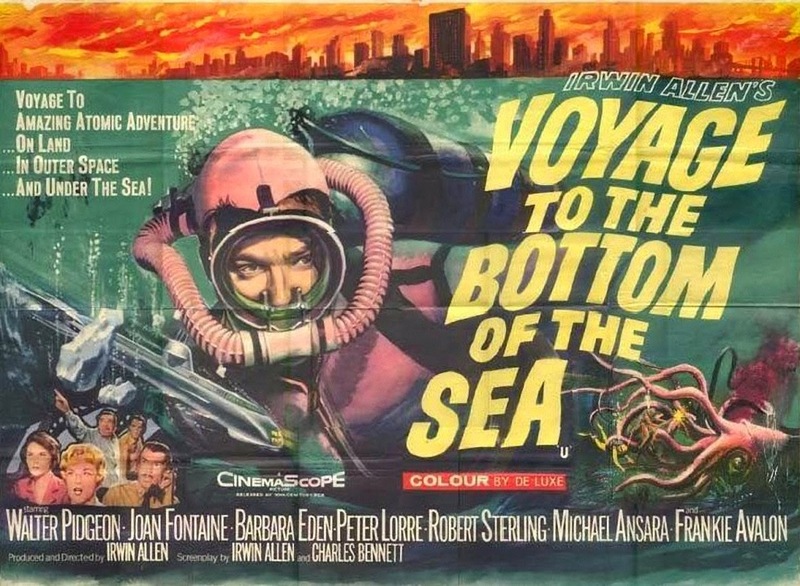 Admiral Nelson (Walter Pidgeon) takes his new nuclear sub for a test run when, surprise, surprise, the Van Allen radiation belt gets set on fire, causing the Earth to heat up in an alarming fashion. He comes up with a plan to solve this minor problem and in true American style it involves blowing stuff up with missiles. In his quest he is backed up by Captain Crane (Robert Sterling) and Dr. Susan Hiller (Joan Fontaine) who is a guest on the sub, investigating what happens to people's mental health under severe pressure. Seeing as though I only watched this for Joan Fontaine, it's a bit disappointing where she's concerned. Despite being the film's leading lady she doesn't get a close up for the first half hour. Saying that, there's not much to get a close up of. She spends the whole film looking like a local dignitary opening a new museum of which they have zero knowledge or interest. To say that she is distant is an understatement. The film creates a suitably under water atmosphere due to the sets and the miniatures. It shows the magic of film when some dubious model work and shaking the camera around can create the sense of a crew working under the sea. Saying that there is a shocking scene where an octopus attacks a few members of the crew who are out in their diving gear. They basically roll themselves up in its tentacles and look a bit scared. 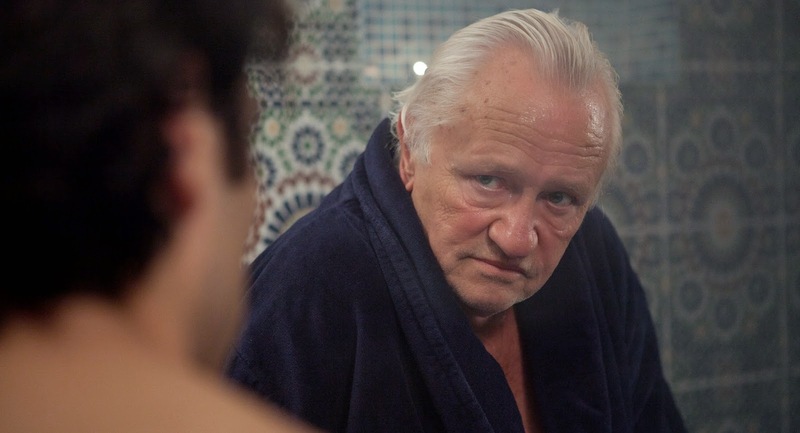 The editing is partly to blame as it lingers for an age on a useless long shot. When it cuts quickly between close up shots of the action, things improve immeasurably and it actually looks fairly convincing. The Day the Earth Caught Fire, The Towering Inferno, The Poseidon Adventure. Now it could be said that normally I watch a right load of rubbish: B-movies, low budget horror and other such cult offerings (Beastmaster 2:Through the Portal of Time springs to mind). So it's a bit of a shock when I actually watch a proper film. And Émilie Dequenne's entry in the FA Cup of Actors is indeed a proper film. Lets start this review by saying how fantastic Émilie Dequenne is. In every film that I've seen her in she's played very different characters. And she's been great in every part. In this film the standout shot is a very lengthy shot of her in a car driving along listening to some music and having a little sing-a-long. But as she drives the viewer is treated (?) 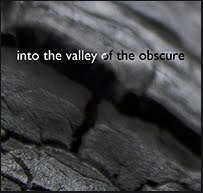 to her visibly crumbling emotionally. It's a cracking bit of acting. She's also not afraid to look haggard and not at all like your typical movie star. In the later scenes she looks really poorly and a complete mess. I don't know how they achieved the look but it's very impressive considering how gorgeous she looks in Brotherhood of the Wolf. She should be a tad on the aggrieved side that she hasn't got top billing. The other two guys are before her in the credits and yet she completely owns this film. The film is shot in a Peeping Tom style, the camera always lurking about being doors, peeking in to watch the family. The director has his reasons for this choice (to give the feeling that they are always being watched) and I can see how that works. 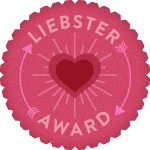 For me, I felt as though I was privy to a side of family life that I wouldn't normally get to see, as if they had invited me into their home, and I felt quite privileged despite what happens in the latter stages. One of the achievements of the film is how it shows the passing of time through its scene transitions. Whether it's a piece of dialogue or a visual, the film quickly dashes through the first part of the couple's life together and gets to the meat of the story. It's all rather cleverly done. 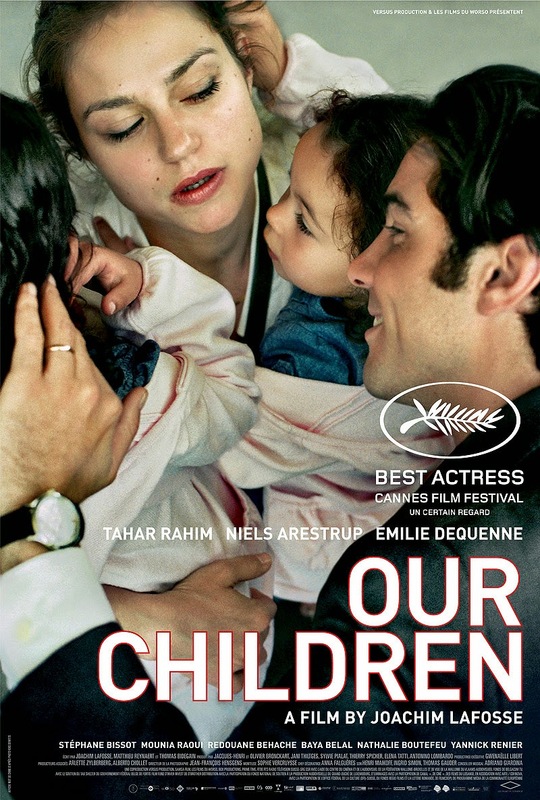 Our Children is a powerful film that is extremely well made. Émilie Dequenne is a force to be reckoned with and on this form is going to be hard to beat. Nathan Fillion didn't have much of a chance against her (unless Serenity had been his random choice) and so he's knocked out with the pretty decent film Slither. (If he'd been against anyone else it would have probably been enough to see him through to the next round.) As things stand though, he's out and Dequenne will go on to face the winner of the Fontaine vs. Crampton match.